This summer, Helen and I joined a Backroads trip in the Italian alps, and we had such an amazing time. The scenery was breathtaking, and I was able to combine 3 of my favorite hobbies: cycling, drinking good Italian wine, and taking scenic photos with my Cannon 4D. After a week of cycling, we hopped across the border to Switzerland for a week of hiking the Swiss Alps. I LOVED THAT! The week of hiking remended me of how much I was missing trail running. So… I decided to start training to RUN the West Coast Trail when we returned to Calgary. RUN the West Coast Trail. Yes – the same 6 day hike Helen, Val and Gary and I did last summer. When we were there, dealing with the mud and terrible conditions, I heard about some crazy people running the entire 75 km trail in a single day. 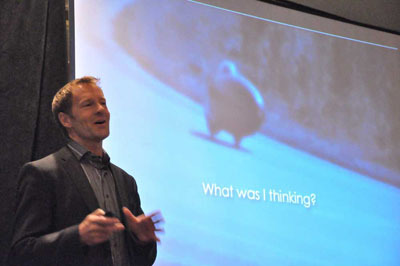 I couldn’t believe it, and that was the spark that ignited my own goal to run it someday. My training has consisted of as many trail runs as possible, with lots of climbing big Mountain in Whitefish, two back-to-back long runs per week ramping up to 5 and 6 hours, once per week of core work at the gym where climbing ‘Jacobs Ladder’ should get me ready for the WCT ladders, and a bit of tempo speed work. As part of my training plan, I organized a 55 km trail run to Assigniboine a week ago. A few weeks ago, Helen and I and two friends Val and Gary Erickson embarked on an amazing 3 day hike from Shark mountain in Kananaskis, to Mt Assiniboine in Assiniboine Provincial park where we spent the night, and did some fantastic day hikes around Assiniboine the next day. On the third day, we hiked the 27 km back to Shark. 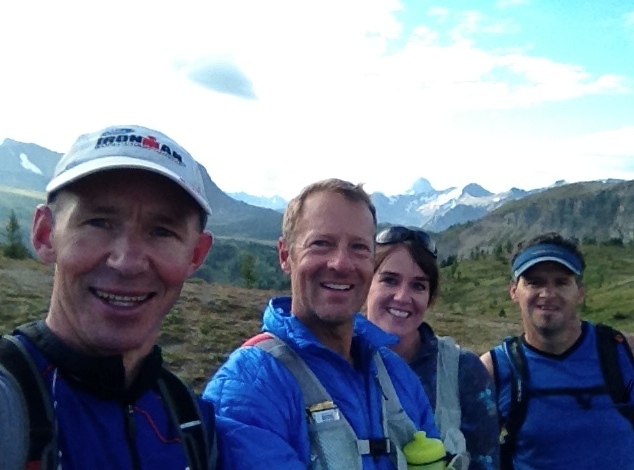 At Assiniboine, I met Michael Fitzpatrick who had organized a group of runners that ran 27 km from Sunshine ski area near Banff, to Mt Assiniboine. They were going to spend the next day doing some trail runs around the area and then run the 27 km to Shark the same day we were heading back. Michael is now running theTransAlpine ultra marathon stage race in the Italian alps. This is 8 straight days of mountain runs consisting of at least 50 km each! WOW! I DEFINITELY WILL do that some day! 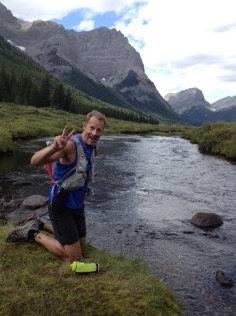 Mike gave me the idea of running the entire 55 km trail from Sunshine to Assiniboine, then to Shark in a single day. So, last Thursday, I met up with my buddy Bryon Howard, and two new friends Emily Compton from Canmore and Brad Peavoy from Fox Creek, Alberta and we ran this amazingly breathtaking trail in a day. Bryon and I were able to finish in about 7.5 hours – which, given the technical difficulty of the trail, and Bryon’s lacking run fitness, we were VERY happy with. I’ve been training quite a bit, but Bryon has mostly been cycling and his training for this run was one 18 km run, and one 28 km run. That’s it – but he did fantastic – no problems at all – a testament to his incredible fitness. I had enjoyed hiking half this trail with Helen a few weeks before, but running the entire thing was a whole new level of ‘enjoy’ for me. I couldn’t wipe the smile off my face the whole day! I took some video with my GoPro camera and put together a quick YouTube vid of our run – enjoy! I was planning to run the WCT at the end of September, but after a phone call yesterday to the trail office in Port Renfrew notifying me that the trail is now is very good condition and DRY.. I decided to seize the opportunity, and do it now while the conditions are good. I’m still a bit fatigued from the Assiniboine run only a week ago, and 3 days in a row of climbing Big Mountain in Whitefish immediately after the Assiniboine run, but I think my body will rise to the challenge, and I believe the trade off in exchange for decent trail conditions is worth it. It is a bit of a safety issue as well. So – Helen andI are off to Victoria tomorrow morning. We will rent a car, drive to Port Renfrew and I will take the mandatory orientation class at the Parks Canada office near the trail head. Then on Sunday morning at about 5:30 am, I’ll paddle a cheap, throw-away inflatable raft across the Gordon river to the start of the West Coast Trail, and start my run. Sunrise is at 6:41, so I’ll have about 45 minutes of running with my headlamp. My goal is to run it in under 12 hours. The record is currently held by Gary Robbins of 10 hours, 6 minutes. (click Gary’s name to watch his video of the record). Gary is a TRUE INSPIRATION!! Aside from the joy of running in one of the most beautiful places on earth, I’ll be dealing with many challenges: mud, an extremely technical trail, tidal surges, 70 ladders, 130 bridges, 4 cable cars, climbing huge boulders, watching tide charts for beach portions, bears, cougars, remoteness (average of 1 evacuation every other day & help could be 12 hours or more away), the possibility of missing the last ferry crossing at the Nitinat narrows which would result in having to bivy in a plastic bag under a tree for the night. Here is a photo of my gear: 3000 calories consisting of power bars and gels, headlamp, advil, goPro video cam & spare battery, water purification tabs, iPod, Hand held water bottle, water bottle, running pack, TP, shirt, shorts, socks, shoes, arm warmers, rain jacket, map, emergency whistle, emergency space blanket, water proof matches, and a few bucks for a Coke at the ferry crossing. I’m PUMPED!!! After the run, Helen will meet me at the northern trail head in Bamfield and we’ll head to our hotel for the night. I could NOT DO this without help, and I am so grateful to Helen for helping me with the logistics. I know she wants to be running it with me, but she is still dealing with a nasty hamstring injury. After dropping me off at the start in Port Renfrew, she will have a 5 hour drive on LOGGING roads to get to Bamfield! This is one REMOTE part of Canada! Bamfield is on the Pacific ocean and the southern side of a large sound called Barkley sound. In the middle of the sound are the famous broken islands where we did a couple of kayak trips with our kids when they were younger. On the northern side of this sound is Ucluelet, and Tofino – locations of my many sea trials with my ocean crossing boat WiTHiN. I have very fond memories of this entire area – the most amazing, wild and natural place on this earth in my opinion. Fantastic blog post Greg! Awesome photos and video! I used to do triathlons etc but injured my spine doing freefall I miss it and envy you!